For years now Rybka has dominated the computer chess scene. No other program has been able to achieve a similar increase in playing strength. For chess analysis Rybka has long become one of the most important analyis tools of professions and amateurs alike. So that this state of affairs will continue in the future, the Rybka-team gathered around programmer Vasik Rajlich has developed a new version which is even better: „Rybka 4 plays more aggressively and more tactically“.During the last two years the engine has been improved in almost all areas. One major theme has been the understanding of the attack on the king. The new Rybka 4 is in this case more precise and reliable than its predecessor. At the same time the search function now operates more quickly and efficiently and the evaluation function delivers even more spot-on judgments. As for the playing style, Rybka 4 logically continues the development of the past few years. 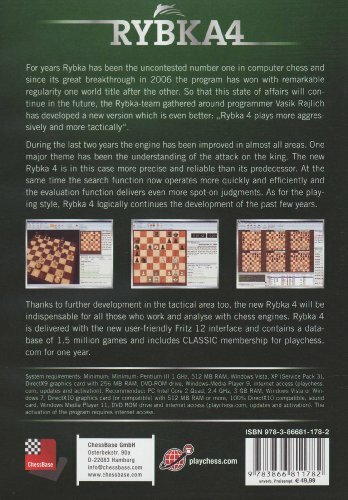 Thanks to further development in the tactical area too, the new Rybka 4 will be indispensable for all those who work and analyse with chess engines. 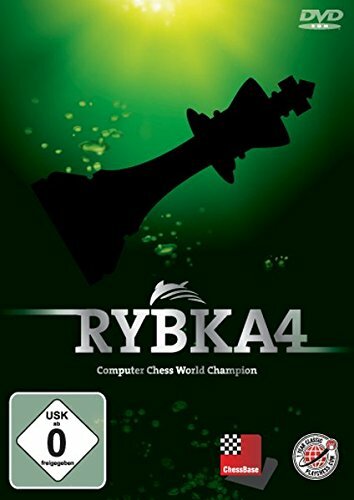 Rybka 4 is delivered with the new user-friendly Fritz 12 interface and contains a database of 1.5 million games and includes CLASSIC membership for playchess. com for one year.